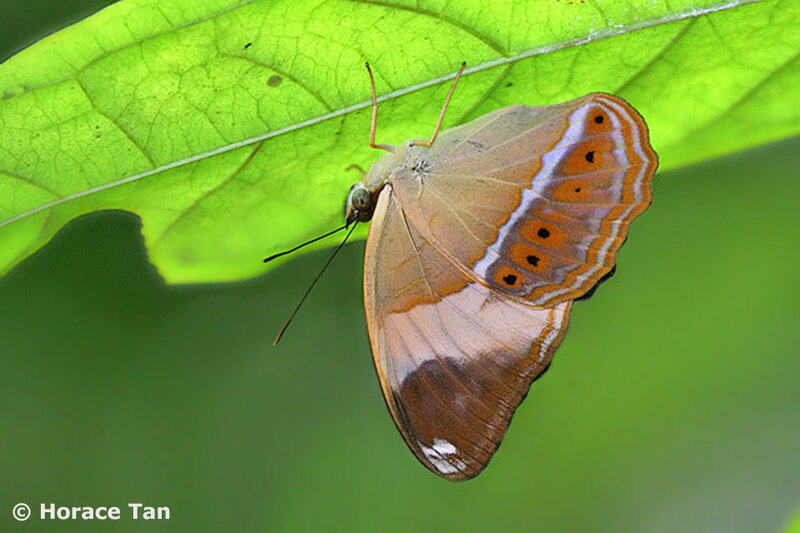 Most regular butterfly watchers will know that the flying speed and style of flying vary amongst the species of butterflies found in Singapore (and elsewhere for that matter). 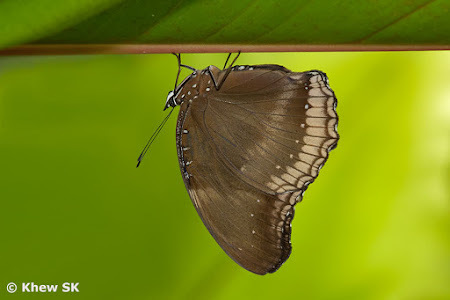 After a time of watching them, a butterfly watcher should be able to tell the difference between the fast-flying Papilionidae like a Tailed Jay or a Banded Swallowtail, always flying as though the devil were at their heels; and the slow, unhurried graceful flight of a Common Tree Nymph. 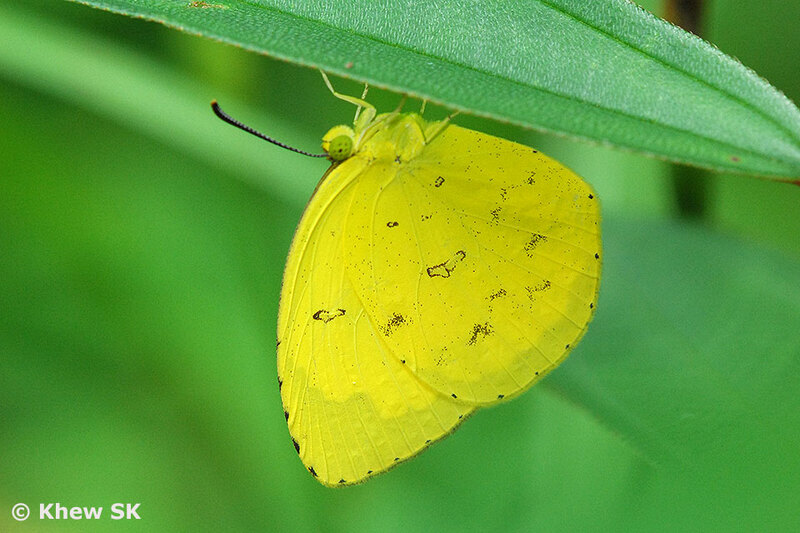 Besides having their preferred habitats, many butterfly species have unique behavioral adaptations that are interesting and help to narrow down the identification of several species, simply from the way they behave in the field. One such interesting behaviour amongst butterflies, is the peculiar habit of flying and then settling on the underside of a leaf, hanging upside down like a bat. It is not fully understood why some butterflies do this. Perhaps to hide from a predator? Or is it for some other reason? 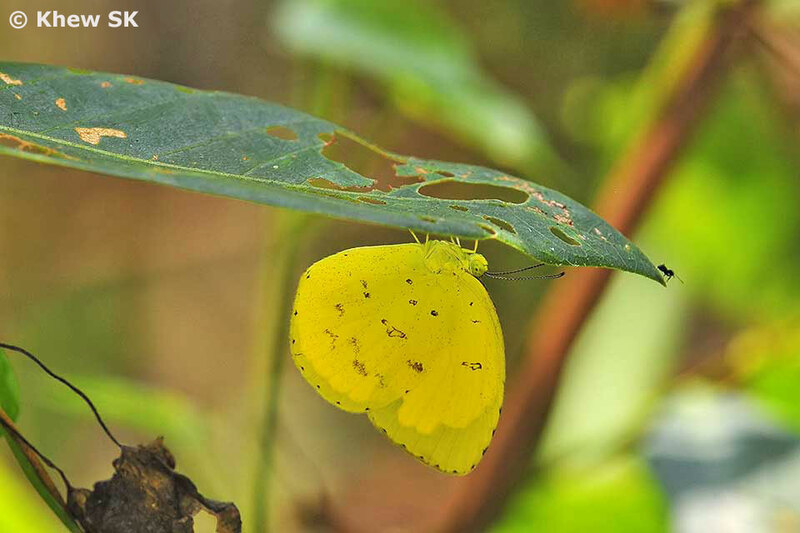 Not much research has been made to establish why some butterflies rest upside down on the underside of its leaf perch. In most cases, the butterfly just rests on the underside of a leaf and stays there, doing absolutely nothing. There is usually no food source nor is the butterfly engaging in any specific activity. 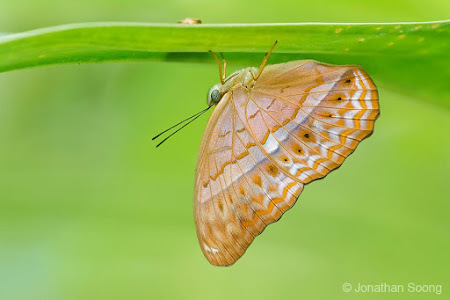 There are some species that oviposit on the underside of a leaf, but here, we are discussing those species that do nothing else except perch on the underside of a leaf. 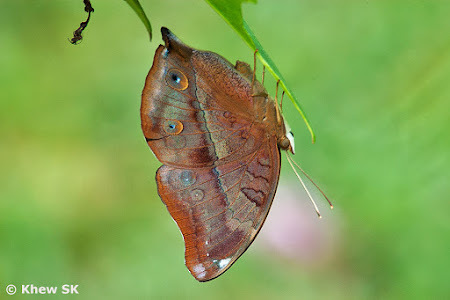 The "king" of the upside down butterflies should be the Purple Duke (Eulaceura osteria kumana) also known as the Elegant Emperor in some countries. This species is regularly seen displaying the under-leaf habit. 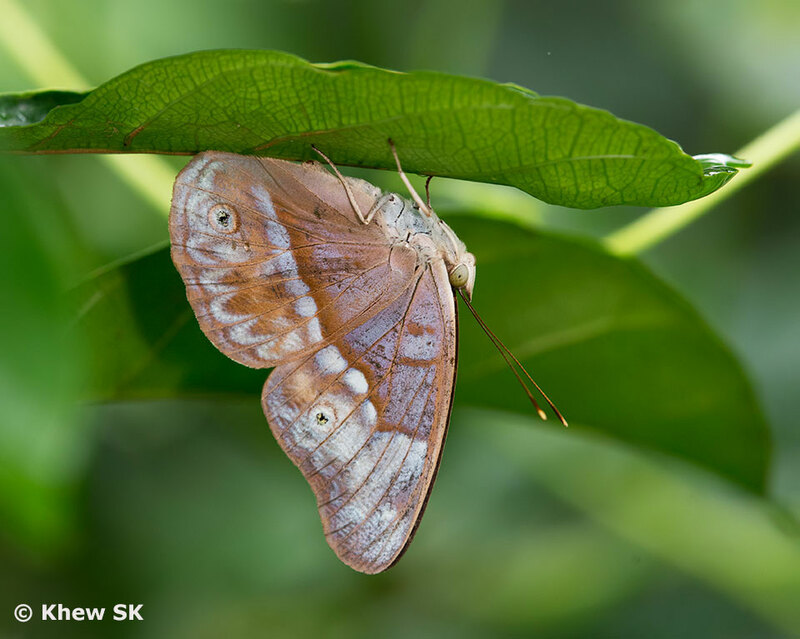 When disturbed by any movement, the Purple Duke darts out, flies rapidly and then suddenly stops on the underside of a leaf to perch with its wings folded upright. It will repeat this behaviour again and again. This unique upside down behaviour occurs in both males and females of the Purple Duke. 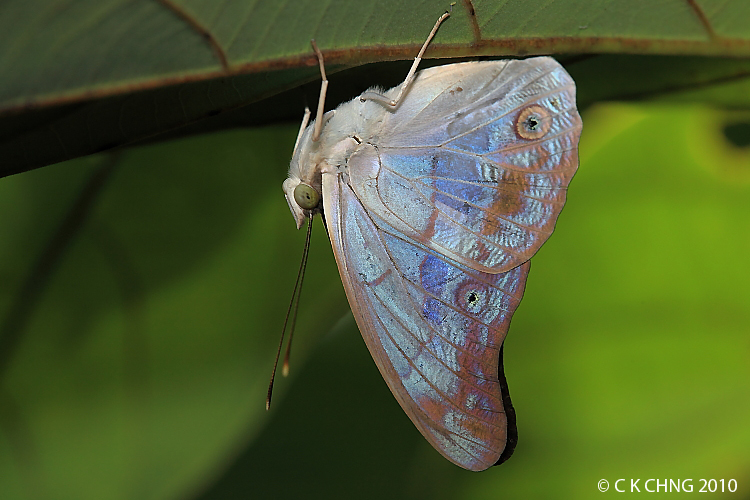 Occasionally, it perches on the top of a leaf and opens its wings flat to sunbathe. But getting a good shot of an open winged Purple Duke is quite challenging, as it usually sunbathes in the early hours of the morning before the sun warms up the environment. 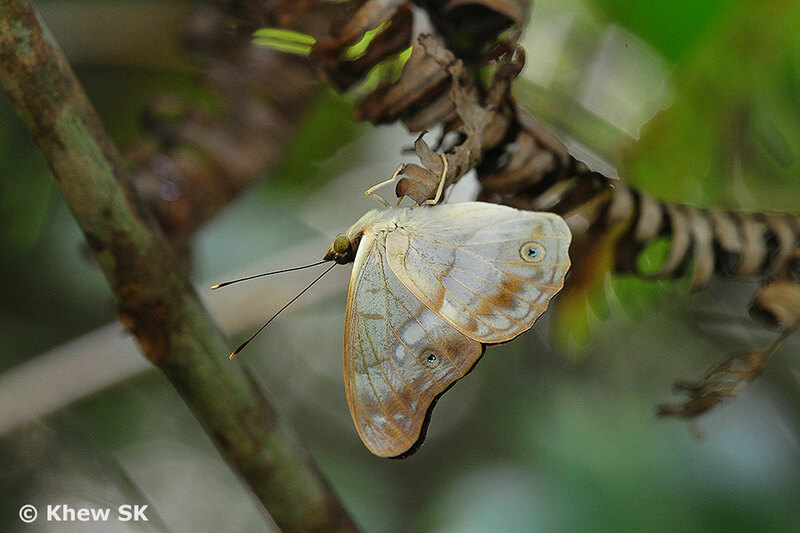 The Papilionidae usually perch on the tops of leaves when they need to rest after flying, like this female Great Helen is doing. Sightings of them perching under a leaf are extremely rare, if ever! 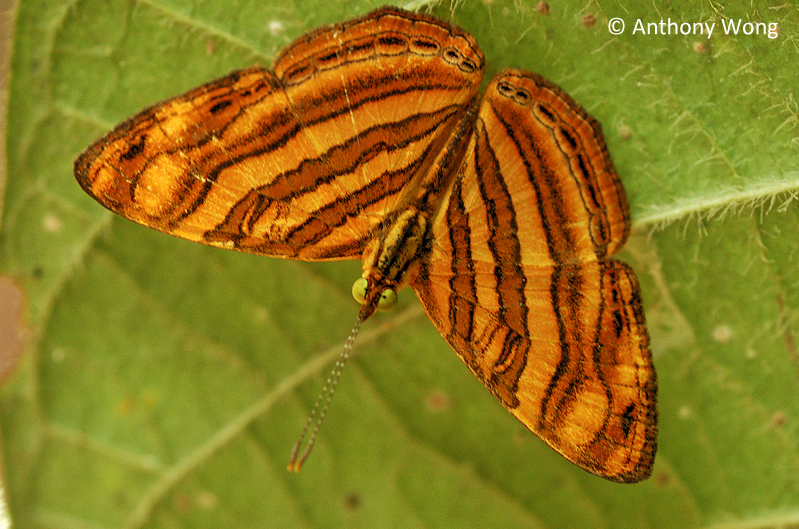 Going through the families of butterflies, we start at the Papilionidae. 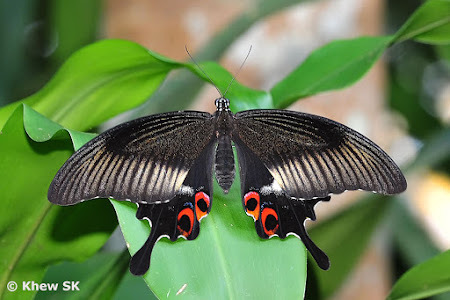 I have not come across any species of the Swallowtails and Birdwings in Singapore that displays the perching under-leaf behaviour. Perhaps due to their large size, it would be physically difficult for a Papilionidae to hold on comfortably to the underside of a leaf. The Crows and Tigers of the subfamily Danainae also do not display this behaviour at all. 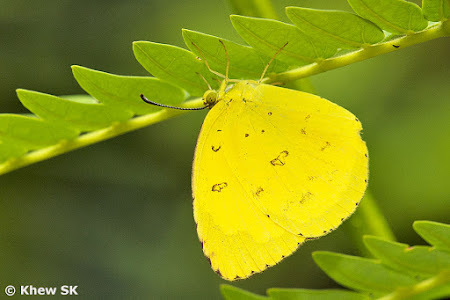 Surprisingly, there are some species of the Pieridae, particularly the Eurema spp. 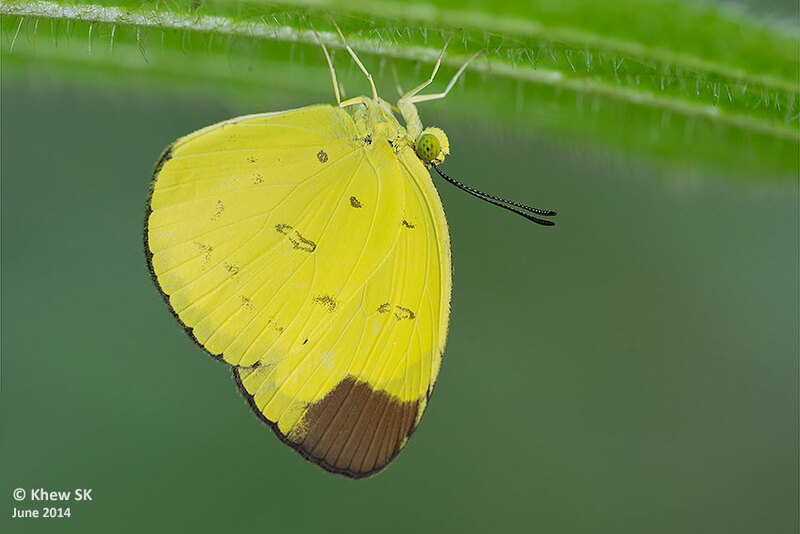 or Grass Yellows, displaying this habit. Although it is not a frequent habit amongst these species, they have quite often been seen to rest on the underside of a leaf with their wings folded upright. 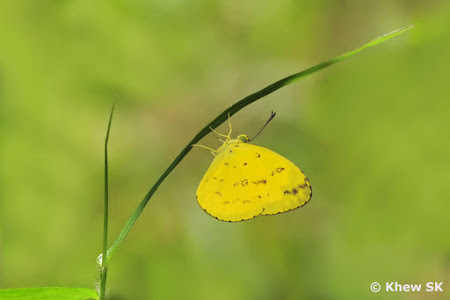 This is more often observed when there is a whole group of puddling Grass Yellow butterflies and some will fly off to nearby bushes to rest upside down after feeding. However, they are skittish and alert and will fly off elsewhere if disturbed. Unlike the Purple Duke, they may not fly to another upside down perch. 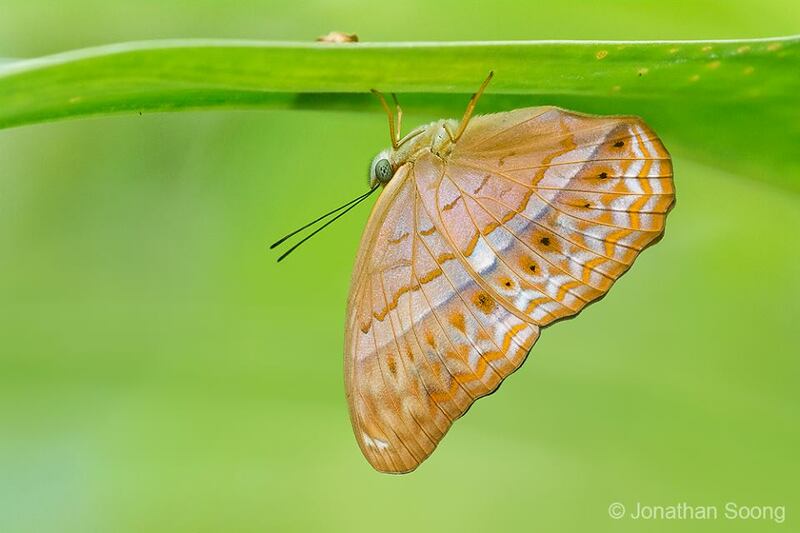 Amongst the other Pieridae, I have observed some species of the Catopsilia often referred to as the Emigrants, hiding on the underside of a leaf. However, such sightings are not common. Moving on to the family Nymphalidae, I have not had the chance of observing any of this upside down behaviour amongst the subfamilies Danainae, Satyrinae, Charaxinae Biblidinae and Limenitidinae. Amongst some species of the Nymphalinae, I have come across this under-leaf behaviour in the Autumn Leaf, Malayan Eggfly, Great Eggfly and Jacintha Eggfly. However, the occurrence of such upside down habit is rare and in some cases, the butterfly that I observed was ovipositing or feeding on some sap on the underside of the leaf. The Cirrochroa species found in Singapore - Malay Yeoman, Banded Yeoman and Common Yeoman are seen to display this upside down perching behaviour at times. 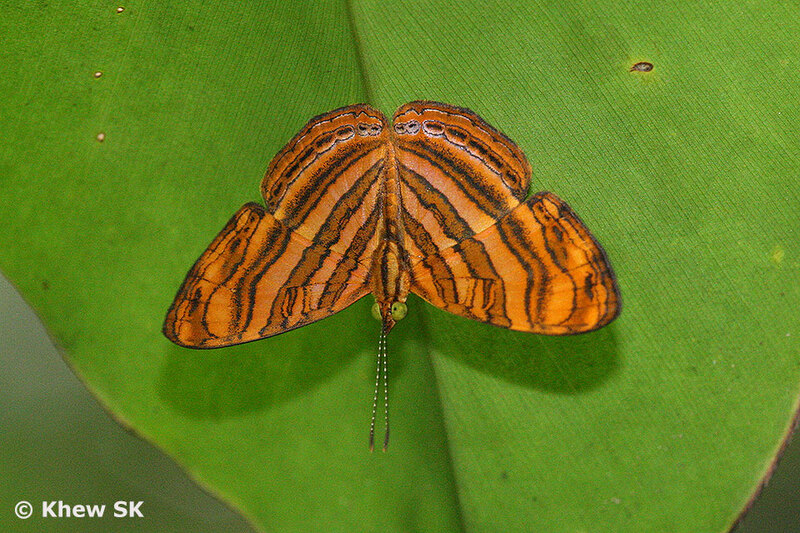 In this photo, a Banded Yeoman clings onto the underside of a leaf with its wings folded upright. The subfamily that features several species that has the habit of resting on the underside of a leaf is Heliconiinae. 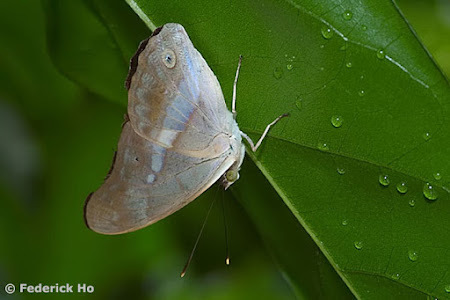 In Singapore, all three species of the Cirrochroa spp. usually referred to as the Yeoman butterflies, are often observed to hide on the underside of a leaf with their wings folded upright to rest. Although this behaviour does not happen quite as often as in the Purple Duke, there are more frequent sightings of the Yeoman butterflies displaying this upside down habit. In some observations, the butterfly clung on to the underside of a leaf, but kept opening and closing its wings for a period of time. 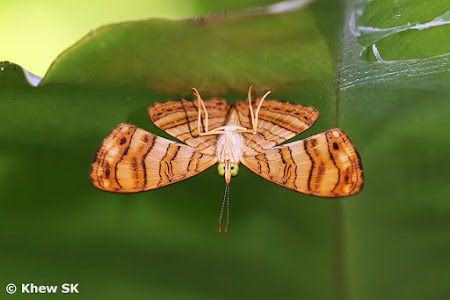 The Royal Assyrian is another species that is often encountered perched upside down on the underside of a leaf with its wings folded upright. Another species in the Heliconiinae family that can be said to often display this under-leaf habit, is the Royal Assyrian (Terinos terpander robertsia). This species is the only representative of the genus in Singapore, but again, it has often been photographed whilst perched on the underside of a leaf with its wings folded upright. 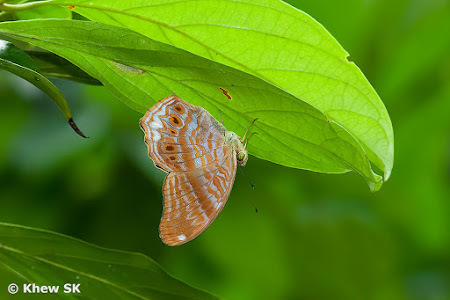 In some encounters, the butterfly was in full view although perched on the underside of a leaf, giving reason to wonder if it was doing so to avoid being seen, or for some other reason yet to be discovered. In the last subfamily of the Nymphalidae, is the sole representative of Cyrestinae in Singapore - the Little Maplet (Chersonesia peraka peraka). This small butterfly is very skittish and has the habit of stopping on the underside of a leaf with its wings opened flat. It then flaps its wings slowly open and close whilst perched in the upside down position. When disturbed, it repeats this behaviour and moves from leaf to leaf, often testing the photographer's patience to the limit! 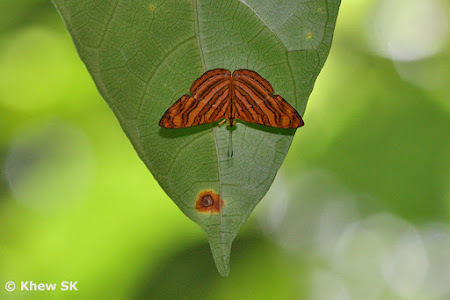 So, if anyone out there has done specific research on why some butterfly species displays this behaviour of perching upside down like a bat, on the underside of a leaf, please share your views in the comments section below. Or if anyone has other photos of other species displaying this under-leaf behaviour, kindly also share your observations. The next part of this article will feature species from the Lycaenidae and Hesperiidae species that also display this upside down habit.